PHOTO: Australia Zoo founder and “Crocodile Hunter”, Steve Irwin, poses with his with wife Terri and children Robert and Bindi. World-class exhibits attractions aren’t easily borne – and they’re not easy to maintain either. Years of bad management are coming to ahead at Australia Zoo, with reports of unnecessary rare animal deaths, illegal administration of drugs in the adjoining zoos, and reported complacency from manager Terri Irwin. Running a zoo can’t be easy. Australia Zoo has become one of Australia’s best-known man-made attractions on the back of the late Steve Irwin’s Hollywood success. Isn’t that just the point though – no matter the origins of the business, management principles remain constant. Managers have an imperative to protect their core competencies, to make those profitable, and to position their unique/competitive competencies to sustain the business through variable market conditions. Add to that the business’s social obligations – the treatment of their staff, their place in the community, the burden of responsibility of managing a popular brand that everyone puts their two cents into – and the management of any tourism/ hospitality operation can become an enormous burden. Australia Zoo is reported to be suffering from an identity crisis. Highly qualified staff are leaving on principle over poor animal treatment, and even newbies are reported as recognising that Steve Irwin wouldn’t have wanted his zoo managed in this way. Australia Zoo is in desperate need of leadership. Steve Irwin’s mate, Wes Mannion, appears to have made a bad hire in another friend from the US, Josh Ruffell. Mannion is now faced with a terrifying prospect – hire a management consultant, or the zoo will die. The Tourism News implores Mannion: don’t wait until the zoo is a husk, until every marketing relationship is broken before low visitation and poor reputation forces you to sell off the venues in an ugly fire sale to Clive Palmer or an entertainment conglomerate. The management of Australia Zoo must seek out a management consultant who can advise them on a suitable restructure. Find a former manager of a business that you love, who can help the business balance the complexity of tourism marketing for zoos with the complementarity of the attached animal hospital. A great manager would not just restore the zoo to its former glory, but dream big, like Steve did – to have the Zoo as a beacon of tourism light for millions of tourism from across the world. Australia Zoo could be the lighthouse for Asian tourists in the Asian century, and a symbol of gritty Aussie managerial capability can bring a diverse and ailing business back from the brink. Can Australia Zoo punch its way out of tough times? Steve Irwin wouldn’t have it any other way. WALKING through the gate at Steve Irwin’s Australia Zoo, dressed in crisp new khaki, Jane (not her real name) thought she had finally landed her dream job. Young, experienced and brimming with passion for wildlife, she believed she’d spend the rest of her career at the world-famous facility. But that dream, as the cliche forebodes, soon turned into a nightmare. Inside the zoo cult, Jane says she experienced bullying, intimidation, incompetence and a ‘toxic” work environment that she dreaded each day. By the time she resigned and was abruptly escorted off the grounds — a traumatic ritual that has befallen numerous employees — Jane was a broken woman. “I remember being in a ball, literally curled in a ball, on my apartment floor, bawling my f—— eyes out,” she recalls. “A mess — a shell of who I had been only a year prior.” Jane’s story is repeated by other ex-employees who have come forward and spoken to The Sunday Mail over the past two weeks. They had toiled in fear and silence and, even after leaving the zoo, kept quiet about their experiences, ever paranoid they’d be hauled to court for breaching confidentiality deeds. But as allegations of animal mistreatment and bullying at the zoo and not-for-profit wildlife hospital were publicly exposed this month, many agreed to talk anonymously ‘in the hope that perhaps something will be done”. Says one former zookeeper who was employed for four years: “This is only a glimpse into the reality behind the smiling faces and perfect image that is Australia Zoo.” Almost 10 years after Steve Irwin’s death, staff who never even met the man believe he would not tolerate the alleged treatment of employees and animals. Steve was a man with an undeniable passion for nature, and those who worked with him say he was an equally enthusiastic boss. 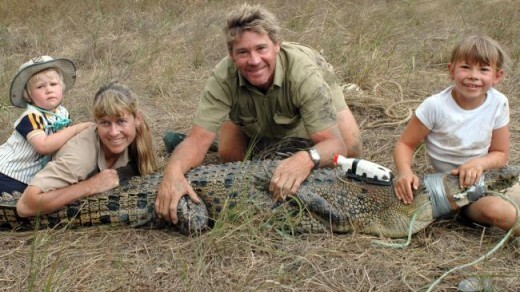 The Croc Hunter’s widow, Terri, has made it her life’s work to keep alive her husband’s dream and memory. But with the Irwins often overseas or busy with Bindi and Robert’s lucrative television and movie careers, the zoo’s day-to-day affairs are left to Steve’s ‘best mate” from the old croc-jumping days, Wes Mannion. Wes has a touch of Steve’s ebullient personality and has worked at the zoo since he was 18, climbing to zoo director. Staff say they are not overly fond of Wes, but it wasn’t until he hired a friend from the US, Josh Ruffell, that the real troubles began. Ruffell is blamed by many former employees interviewed by The Sunday Mail for their departure and for fomenting a toxic culture that has permeated the zoo and wildlife hospital. Ex-employees say they raised issues with the zoo’s human resources department, naming Ruffell as the cause of their upset, describing him as a bully and detailing examples of alleged intimidation and favouritism. Under his reign, staff say they were abruptly sacked, shoved into different roles and excessively reprimanded. In response to the allegations, a zoo spokesperson says staff can lodge formal complaints through internal disciplinary processes. “We have zero tolerance to bullying and try to uphold the highest standards for our staff,” the spokesperson says. “All of our recruitment and disciplinary processes are subject to the same government regulation as any organisation. No one (at the hospital) has chosen to utilise any of our processes.” But former staff say Mannion’s right-hand man appeared untouchable and was given more and more responsibilities — taking on curator roles in reptiles, crocs, birds, and roving entertainment. It wasn’t just staff who suffered. Sources have blamed Ruffell’s decision-making for the deaths of animals, including the zoo’s prized Jabiru named Djagarna, a 4m saltwater crocodile Shaka and an endangered species of crested iguana. Australia Zoo has said Shaka’s cause of death was unknown and that it had been bagged correctly but died due to complications during transport. Despite the discord, Ruffell’s reign spread and triggered a revolving door of staff. “We were always told, if you don’t like the place there’s always somebody to replace you,” recalls one former zookeeper. “But people didn’t want to go anywhere else. They were in their dream job.” A single employee at Australia Zoo is one of hundreds. So when two or three people leave — or even 10 in four days, as Jane recalls when she resigned — the departure causes little upheaval. But at the Australia Zoo Wildlife Hospital, where a small team of experienced vets and vet nurses treat up to 7500 injured native animals each year, a few resignations will be felt. The hospital was opened in 2004 in honour of Steve’s late mother Lyn. Located in a separate building at the opposite end of the zoo carpark, the hospital had long existed in a protected bubble, largely unaffected by the zoo’s internal dramas. But in July last year, the hospital crew was invited to dinner with Terri Irwin at The Beerwah Tavern down the road from the zoo. It was billed as a chance for the power businesswoman to get to know the team. But sources who attended say Terri sat at her own table and didn’t mingle. “She basically gave a 30-minute speech and talked about herself, and how we were all lucky to have our jobs — and we should accept any changes,” one former vet nurse recalls. “About a month later Josh (Ruffell) was brought in.” Ruffell was apparently pulled in to change the direction of the hospital, although staff were unsure what that meant. (It appeared new employees were subsequently being hired on personality rather than just experience). Zoo director Mannion says the new overseer was raising the bar “massively high” at the facility, which already provided the highest standard of veterinary care to wild animals rescued from roadsides and backyards. Within months, a vet nurse with more than 20 years’ experience was the first employee abruptly called to a meeting with Ruffell and HR and told to grab her lunch. After five years tending to injured natives, she was moved to the zoo’s birds department as an ordinary keeper and prevented from returning to the hospital. Her departure unnerved colleagues. Then the hospital receptionist was uprooted and sent to work in zoo mammals. The next to go was a vet nurse who had raised concerns with her supervisor about Terri and a group of VIPs entering intensive care where a sick koala was on seizure watch. By the time a fourth employee was shafted — and repeatedly questioned if she was pregnant — morale at the hospital had plummeted. But worse than that, the three departing qualified and experienced nurses were replaced with zookeepers and unqualified recruits. Over the space of about a year, 12 vet nurses and five vets from a pool of 16 vet nurses and four fulltime vets resigned, unable to accept the reduction in veterinary standards. Head vet Claude Lacasse was also stripped of her managerial duties, and another vet who had voiced her disapproval was sacked part-way through a koala surgery. Meanwhile, the zoo director’s fiancee Cindy Menzi was brought in as a vet nurse despite her lack of qualifications. A zoo spokesperson explains the forced role changes by saying all employees have the potential to learn new skills. “By providing the opportunity for this to occur, we are consistently improving every aspect of our organisation with upskilling and cross training.” However, rookie replacements were hired who had never worked with wildlife — or had no experience with any animals — and because of the staff exodus, few people were left to train them. The new staff worked unsupervised on night shifts and made unqualified medical decisions. Long-serving staff say the wildlife hospital used to have an impeccable record. Any creature — from a green tree frog with a broken leg to a koala hit by a car — was nursed back to health and released into the wild. But as the pool of expertise drained with each resignation, the first cases of animal mistreatment began to arise. Vet nurses without any qualifications and training were not detecting injuries and illnesses because they had no idea what to look for. A koala suffered for weeks without pain relief because nurses didn’t realise its arm had been broken, possibly after being dropped in care by a staffer unsure how to handle the wild animal. Despite its foul odour, a necrotic shell was not realised on an eastern long neck turtle that then had to receive stronger antibiotics. The Sunday Mail has uncovered about 10 alleged examples of animals given the wrong care or worse — that suffered further injury — because of inexperienced staff. There was also a concerted management push to allow the unqualified staff to administer drugs which is a violation of state laws. Worried staff secretly urged Queensland Health to undertake a surprise audit, which uncovered five breaches of the law, including the unqualified administering of medication. Under such difficult conditions, the staff exodus continued until last week when the last fulltime vet handed in her notice. Two government agencies — Biosecurity Queensland and the Veterinary Surgeons Board — announced they would investigate the hospital, but former staff fear management will sweet-talk authorities and nothing will change. Staff often wonder whether Terri Irwin is aware of the internal troubles. On the one hand, she appeared to be issuing an early warning to expect change when she dined with hospital staff at the tavern and hasn’t responded to a letter written by four concerned vets. On the other hand, the Irwin family circulate in a celebrity world and have many competing projects. People who have met the Irwins describe Terri as smart and funny and the children as sweet. Jane says she is still grateful to have experienced the dream of a lifetime, even if it ended so horribly. She has since worked through the stages of grief, and her best coping mechanism, she says, is to try not to think about her time at the zoo. A number of former staff told The Sunday Mail they had undergone therapy or seen psychologists. “The way I was treated (when I was escorted off the premises), I was distraught, in tears, crying all over the place; I felt my heart had been well and truly ripped out,” says another former zoo employee. Fresh tears of a different sort flowed last week, however, when news spread through the ex-zoo network that Ruffell had been escorted off the premises. The Sunday Mail understands the man allegedly responsible for many others taking that same walk of shame has been the focus of a workplace investigation over alleged harassment. “I broke out crying when I found out,” Jane says. “I wish the zoo no ill will, and particularly wish no ill will for the wildlife hospital which used to be a shining beacon in conservation,” she says. The Sunday Mail contacted Mr Ruffell for comment but he referred questions to the zoo. Former Australia Zoo staffers fear all of Steve Irwin’s good work is being undone. Steve Irwin’s best friend Wes Mannion has risen to director of Australia Zoo. Zoo director Wes Mannion does some croc wrangling of his own. Josh Ruffell, pictured with Tourism Minister Kate Jones, is blamed by many staff for a toxic culture at the zoo. Wildlife Hospital staff and a veterinary student tend to an injured kookaburra. The zoo director’s fiancee Cindy Menzi was brought in as a vet nurse despite her lack of qualifications, staff claim. Watch the tiny male rhinoceros calf bond with his mother. Courtesy Australia Zoo. Robert, Bindi and Terri Irwin are continuing Steve’s work, but may be disconnected from the day-to-day dramas at the zoo. Robert Irwin’s feeds his first crocodile as he follows in Dad’s footsteps at Australia Zoo.